The Kent Farndale Bursary for the Arts deadline is approaching! The Scugog Memorial Public Library Board, which administers the Kent Farndale Bursary for the Arts, is currently accepting applications for the 2019 Bursary awards. The deadline to submit applications is May 17th at 5 pm. The bursary is open to Scugog residents of all ages who wish to pursue further training in an area of the arts. Previous winners have included writers, performing artists and visual artist working in a wide variety of media. Application forms may be downloaded through the link below or picked up at the Library at 231 Water Street, Port Perry. The Kent Farndale Bursary for the Arts provides financial assistance to residents of Scugog Township who wish to pursue a specific field of study in the arts. It is felt that the whole community is enriched when aspiring or established artists pursue opportunities for further study in their areas of interest. The Bursary is generously funded through the annual support of the Rotary Club of Port Perry and by donations from local organizations and members of the public. Say goodbye to winter and welcome the bold colours and warmth of the coming season with the upcoming art exhibit “20 years of Diversity” by the Port Perry Artists’ Association. The Opening Reception will begin Saturday, April 6th, 2019 at 2 pm. The show will run April 6th – May 2nd, 2019 in the Kent Farndale Gallery in the Scugog Memorial Public Library at 231 Water Street in Port Perry. The Port Perry Artists’ Association (PPAA) is thrilled to be celebrating 20 years of diversity in 2019. This show will present the work of more than 20 members of the group and will include watercolour, oil, acrylic, pastel, ink and collage ranging in styles from realistic to abstract. Check out our latest newsletter to find out what’s happening at the Library this season! We are thrilled to add to our events with some free nature seminars in partnership with North Durham Nature. 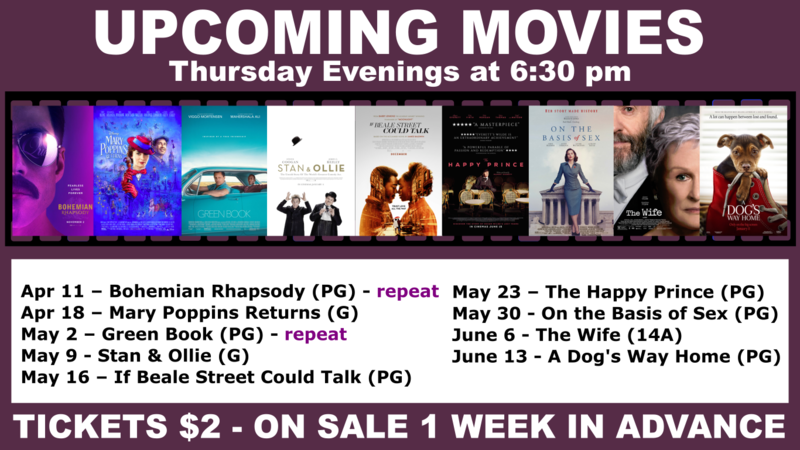 We have also increased our movie nights in order to show films weekly and have added some family-friendly options to the mix. We still have our much-loved book club programs and lots going on for the little ones with our storytimes! There’s something for everyone at the Library!